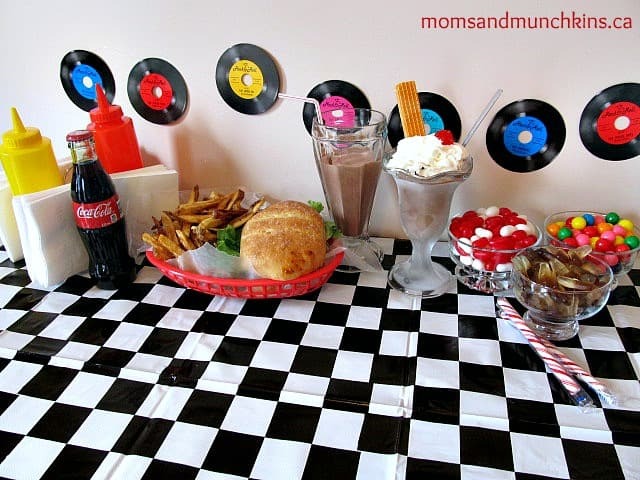 A retro diner party is a fun idea for a fifties themed party or a soda shop inspired birthday. There are so many fun ideas for food, decor and games. These diner party ideas are great for both kids and adults! Your diner party invitations can start off with a fun phrase such as “Shake, Rattle-N-Roll”, “Twist & Shout” or “Rockin’ Around The Clock”. Be creative and don’t worry about sounding silly – that’s all part of the fun! 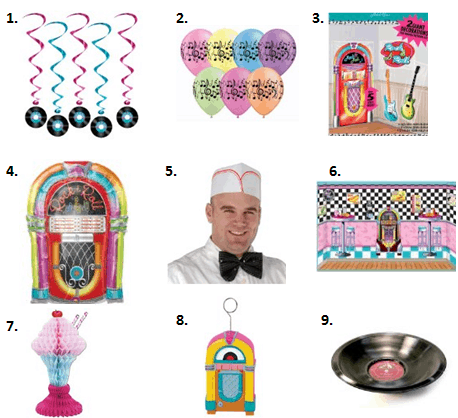 Your invitations could include items such as shakes, floats, jukeboxes, records or anything else with a retro diner party theme. 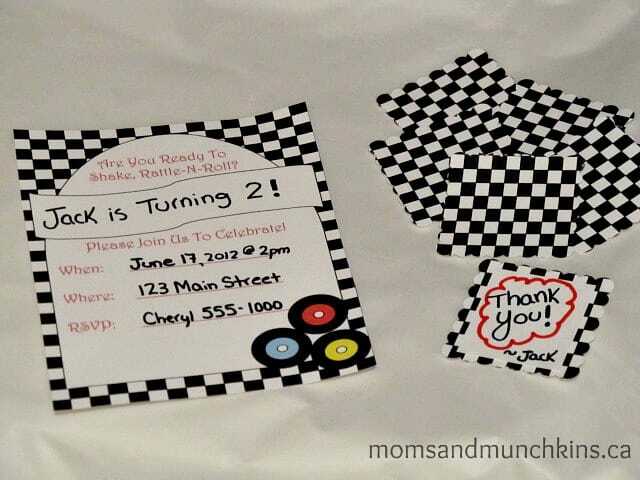 Click here for a free printable invitation (shown below) with free black & white checkered paper that could be used for personalized gift tags. Do you have old records around the house? These can be used for decorations on the walls around the party area. Old record covers can also be used on the wall or placed into temporary frames to display during the party. You’ll want to have something available to play fun retro music from the 50’s, 60’s and even the 70’s. If you’re really lucky, you may have a company in your city that rents jukeboxes! Waiter/Waitress Races: Create a miniature obstacle course with pylons to walk around and streamers to climb over and under. Give each team a plastic serving tray topped with plastic cups of water and some food (something that would be difficult to balance on a tray – like eggs still in the shell). Two teams can compete against each other by racing from one end to another, passing off the tray to the next team member to continue the obstacle relay race. The first team to successfully deliver their tray of food (meaning each person on the team would’ve had to complete their turn) wins! Sock Hop: Put on some music and let the kids have their own sock hop dance party. 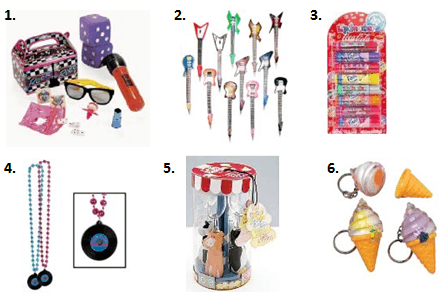 Here are some fun dance party ideas for kids. Diner Party desserts are super easy to make! Use your imagination to create milkshakes for the guests or set up a milkshake station with ice cream, fruit selections and a blender and let your guests create their own. Here is a link to some delicious recipes for shakes and floats. You could also serve ice cream sundaes in fun sundae cups along with whipped cream & cherries. Here on Moms & Munchkins we love a good party! We’re always adding new party ideas so follow along on Facebook, Twitter, Pinterest and Bloglovin’ for the latest ideas. *Disclosure: I am part of the Big Dot of Happiness, Amazon, Tiny Prints Inc. and Birthday in a Box affiliate programs. That would be great for an outdoor party. I love retro. This is an adorable and tasty birthday party idea, you can’t go wrong with burgers, fries and milkshakes! Stopping by from SITS sharefest! That is great, I wish I was more creative. Going to start borrowing ideas from you. My daughter was a 50’s girl two Halloweens back- my son a greaser! This is such a cute idea!! !